SALT LAKE CITY— Seven conservation groups filed a formal notice of intent to sue the U.S. 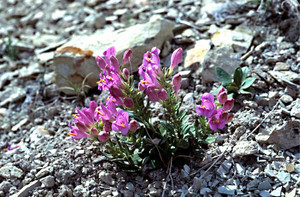 Fish and Wildlife Service today for denying Endangered Species Act protection to two imperiled wildflowers in Utah and Colorado. The Service proposed to protect the White River and Graham’s beardtongues in August 2013 after determining that 91 percent of Graham’s beardtongue populations and 100 percent of White River beardtongues were threatened by the impacts of oil and gas development. The Service then reversed course in August 2014, withholding protection based on its claim that threats to the species were ameliorated by a last-minute, voluntary “conservation agreement” the Service entered into with the Bureau of Land Management and several state and county agencies with active roles in energy development. Graham's beardtongue photo by Leila Shultz. Photo is available for media use. Graham’s and White River beardtongues live only on oil shale outcroppings in northeastern Utah’s Uinta Basin and northwestern Colorado. This badland region is home to dozens of rare plants found nowhere else in the world and supports a complex ecosystem, including mule deer, elk, antelope, mountain lions and black bears. The two wildflowers have been waiting for Endangered Species Act protection since 1975 and 1983 respectively, and the threats to their continued existence have only increased as developers have flocked to Utah hoping to exploit oil shale and tar sands deposits. In its 2013 proposal the Fish and Wildlife Service determined that 84,000 acres should be protected as critical habitat “essential to the survival” of the two plants. But the conservation agreement provides for only 49,000 acres of so-called conservation areas, which will be subject only to weak and voluntarily protections. The Service drew the conservation area boundaries to exclude numerous areas planned for fossil fuel development. “The American people have a right to expect government agencies to follow the law. The Service knows what it needs to do to protect these plants, but politics has trumped science once again,” said Earthjustice’s Robin Cooley. The conservation groups filing today’s notice of intent include the Center for Biological Diversity, Grand Canyon Trust, Rocky Mountain Wild, Southern Utah Wilderness Alliance, Utah Native Plant Society, Western Resource Advocates, and Western Watersheds Project. They are represented by Earthjustice in Denver, Colorado.